Between blissful moments in idyllic waters and thrilling adventures on the Islands of Tahiti, you’ll relish the opportunity to experience ultimate luxury at these top hotels. Peaceful, private beaches and Michelin-quality culinary offerings provide the perfect bookends to days spent parasailing French Polynesia’s lagoons, hiking to waterfalls and exploring lush valleys on safari. Take a closer look at our favorite options for pampering and perfection that embody island paradise. Setting a new world standard, The Brando is a pioneering model of sustainable technology with seawater air-conditioning and renewable energies, without sacrificing luxury or comfort. The all-inclusive resort features 35 deluxe villas, each with its own private beach area and plunge pool. It includes all meals and even activities, from bicycling and snorkeling to diving and paddle boarding. 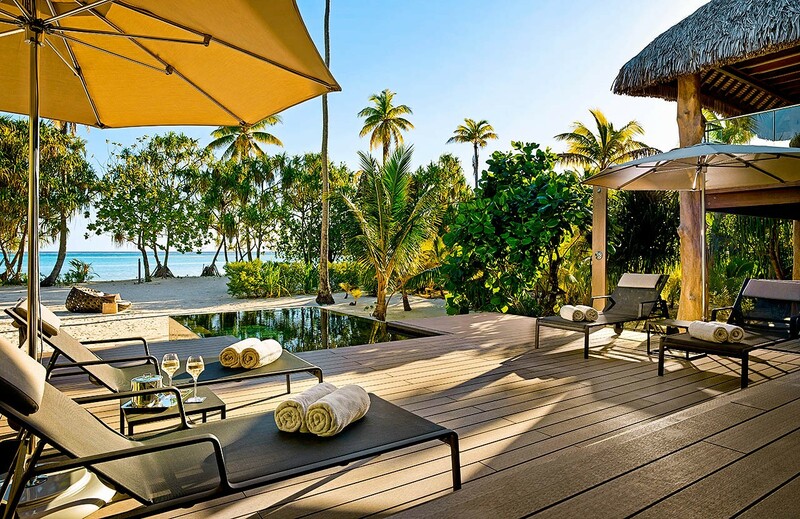 Exclusive and private, The Brando is only accessible via a 20-minute flight from Papeete, the Capital of French Polynesia. The award-winning cuisine of Guy Martin of the two Michelin-starred restaurant Le Grand Véfour in Paris is featured in all dining venues and in-room dining. Plus, all guests enjoy breakfast for two daily. InterContinental Bora Bora Le Moana Resort is an intimate, small hotel snuggled between two renowned beaches and surrounded by lush gardens and palm trees. The hotel is located on the south end of the main island of Bora Bora at Matira Point, famous for its white-sand beaches. The canoe breakfast was first introduced at this hotel. The perfect place for lunch is the Vini Vini terrace beside the freshwater swimming pool with a view of the incredibly blue Bora Bora lagoon. 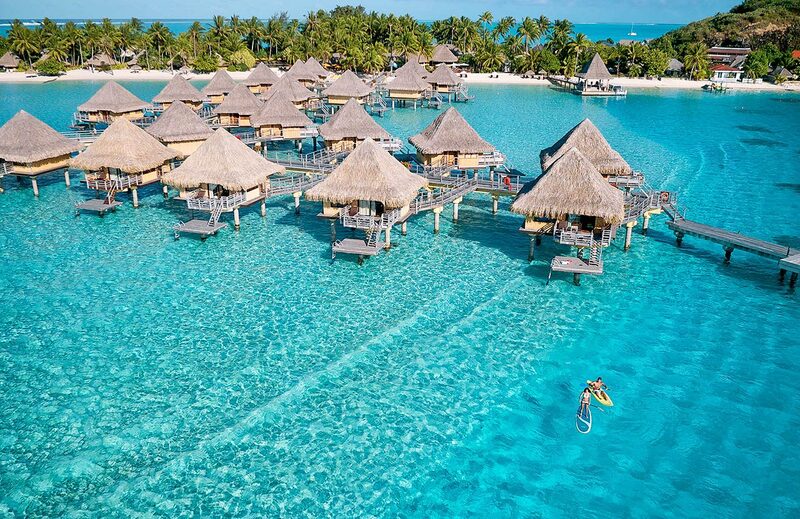 InterContinental Bora Bora Le Moana Resort is a private romantic retreat. 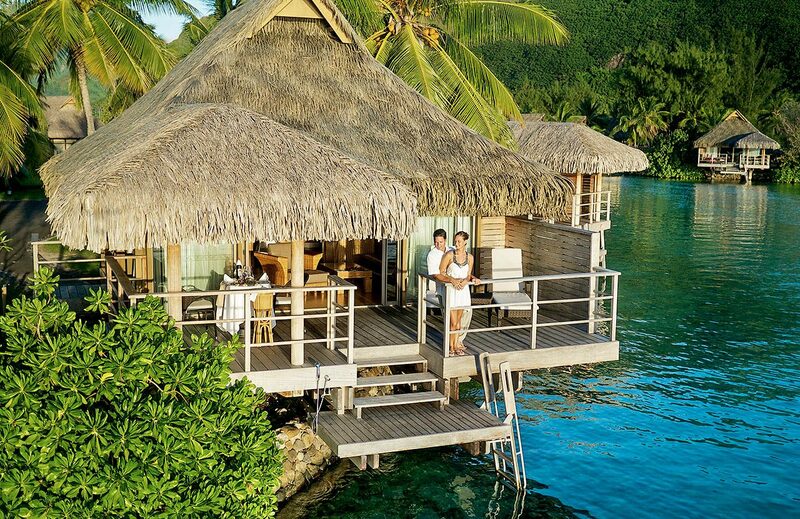 The InterContinental Bora Bora Resort & Thalasso Spa is romantically located on Motu Piti Aau on the barrier reef between the ocean and the lagoon. The resort offers 80 spacious overwater villas standing on stilts over the azure lagoon, Polynesian wedding ceremonies in the Blue Lagoon Chapel, candlelit dinners on the villa terrace and private sunset cruises. Enjoy signature spa treatments with deep ocean water in an overwater bungalow for two. Inspired by Marlon Brando, it is the first hotel in the world to produce its air-conditioning with water extracted from the ocean. 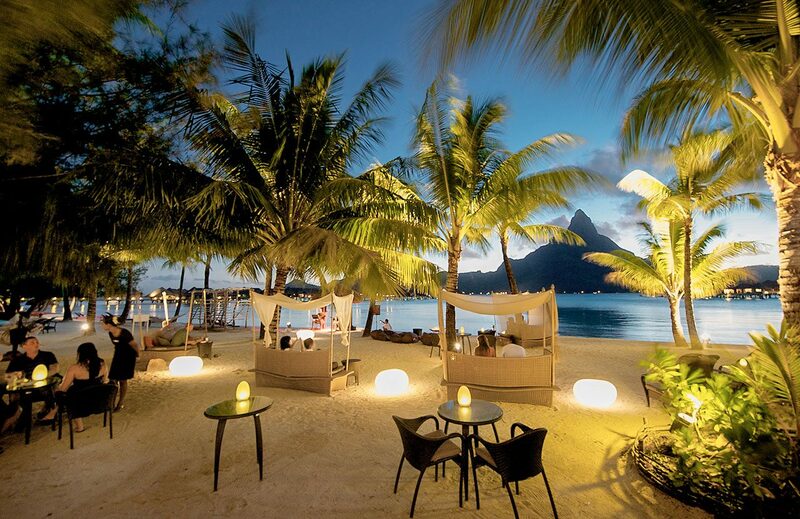 InterContinental Moorea Resort and Spa is set on a beach and 17 acres of luxurious gardens. The location on the northwest side of Mo’orea offers exceptional sunrises and sunsets. The resort boasts the most activities on the island, from water skiing and kayaks to Jeep safaris and dolphin encounters. The Junior Suite bungalows offer the utmost privacy, whether overwater, on the beach or in the garden, with a private plunge pool. Or enjoy a relaxing drink at the swim-up bar in the infinity pool. 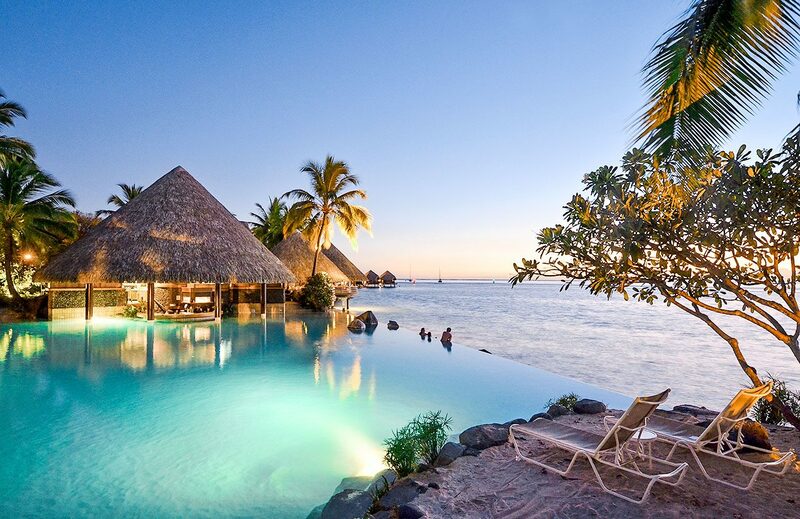 The InterContinental Tahiti Resort & Spa has a superbly romantic location. It sits lagoon-side nestled in 30 acres of tropical gardens, with spectacular views of the soaring peaks of Tahiti’s sister island, Mo’orea. Experience the essence of French Polynesia in beautiful accommodations, decorated with a relaxing Polynesian style. Delight in themed events at the hotel’s Te Tiare Restaurant, which is transformed into a theater for exciting dinner shows that portray the traditional culture of Polynesia. Relax at the Deep Nature Spa and Fitness Center. Enjoy a voyage to awaken your senses for a rich experience within yourself.